Wolfpack Roadmap and Tutorial Videos! Hello everyone, Wolfpack will be released on Friday! 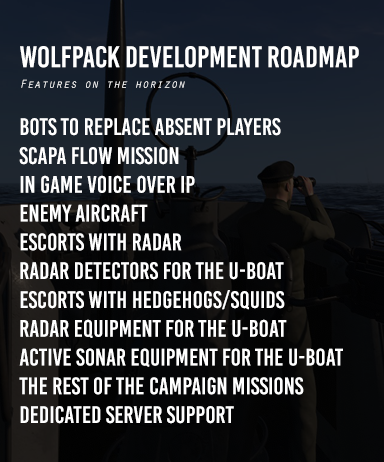 We put this roadmap together to give you an idea of what's next in the development. We also published a series of video tutorials on our YouTube channel. More videos will be added to the playlist as development progresses. Last edited by Onkel Neal; 04-05-2019 at 05:20 AM. Then grab your handy calculator, enter the range that you used in your firing solution and divide by 15.4 .This will give you the estimated time to impact in seconds. To change the estimate to minutes and seconds, simply subtract 60 seconds from the total until you are left with a remainder that is less than 60. Remember: the time to impact estimate will depend on how accurate you were with your range estimate. Press R to reset the stopwatch, and to hide it. FYI: The torpedoes in your Wolfpack U-boat run at 30 knots, which is 15.4 meters per second. Last edited by Onkel Neal; 03-21-2019 at 06:32 PM. Full details and information about the historical U-Boat model. I’ve made tables for the method I use in my Comprehensive tutorial in my sig (computing target speed based on his bearing change over one minute). I’ve put a link to it in my sig. I used a self made whiz wheel in my tutorial but wanted to make the tables for ease of use So people could print them off and keep them at their desk. Instructions are in the document. Tutorial is written using SH3 but of course the methods work for Wolfpack as well. I've put together a quick guide for understanding AOB.